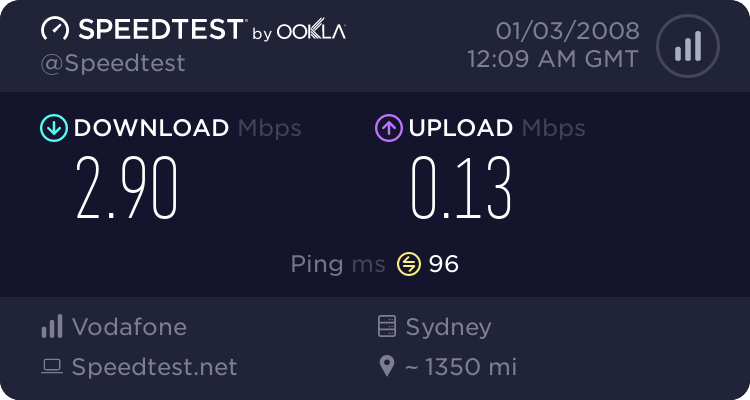 ADSL2+ Speeds - Should they be better than this? 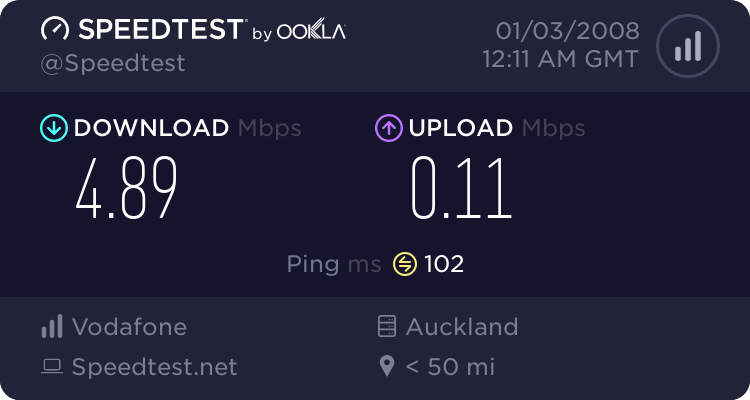 Forums › New Zealand Broadband › ADSL2+ Speeds - Should they be better than this? From the looks of it we had the ADSL2+ profile enabled at the exchange a fews weeks ago however I have not really seem any real differnece it speeds. Previously (On ADSL) speedtest.net using Auckland we used to report around 3-4Mbits (Depending on time of day etc). Now it is around 3-5Mbits (Again, T.O.D. dependant). 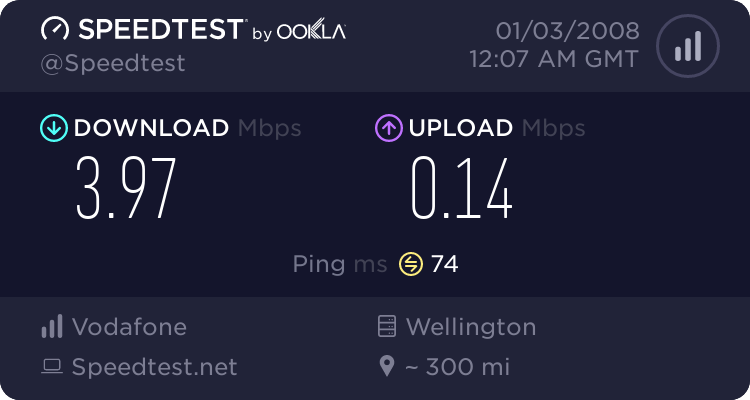 We are approx 700m from the exchange (Courtney Place 2 Exchange in Wellington) and have a sync rate of 18Mbits, we are also with WorldxChange (Xnet) who it says sponsors the Speedtest in Auckland (So I assume its on their network somewhere). a. You have a 128kbps upload speed. This well may cause speed issues. b. Something on the network (profile wise) has not been adjusted. I'd bet A first. Try going on a FS-FS plan. Are you able to explain show the down speed effects the upspeed? To be honest I don't see why I should have to pay the extra $16 or so dollars a month it costs to have full upload speed to use the full potential of my download speed when I already pay for a full line speed down. Because your computer needs to send acknowledgement packets to the server stating that it has received one packet, and for the server to send another downstream packet. With 128k upload, your upstream becomes saturated with ack packets, limiting the number that can be sent. Therefore limiting the download speed. When you are recieving data, you have to send out data saying you've recieved it, this is how the up speed might effect the down speed. I guess I can give that a go. Is it not misleading then for consumers if my ISP is selling me a service 'as fast as my line will allow' when in fact what my line allows is being inhibited by the upload speed of the plan I have selected? IMO 128k is way too slow for an upload speed. TCL do not limit upload speed on their cable network, nor do citylink on their fibre network. 128k has been the standard upload speed even since Jetstart came about with their 128/128 and 128/256 plans. Download speeds have come a LONG way since then, why can't the upload speeds? Go to http://www.speedguide.net/index.php and use the TCP/IP Analyzer to analyse connection. Use TCP/IP Optimizer if required. Once optimised then 128K upload speed will be the limiting factor re: download speed. Once propogation delay reaches 200 msec that your maximum speed drops to 2628 kbps due to small size of receive window. adamj: I guess I can give that a go. Is it not misleading then for consumers if my ISP is selling me a service 'as fast as my line will allow' when in fact what my line allows is being inhibited by the upload speed of the plan I have selected? Well, your downstream is up there, its just its limited by your limited upload... but with a FS-128kbps connection, it is near the fastest your line will go. With FS-FS, you should see an improvement in speeds. TCL may have faster upload speeds on their cable network (are they the maximum allowed? ), but many providers have lower speeds using the same network. How did you come to the conclusion that TCL have unlimited upload speed? It may appear that way compared to your slow speed. but it is definitely not unlimited. I upgraded my FS-128 to a FS-FS plan. The performance difference is phenomonal. Then a day later I was ADSL2 enabled and the speeds doubled (12Kbit ps) the published specs for my ADSL switch was only adsl1 so i'm ratrher pleased and it works superbly... I'm 50 metres from the exchange so there is a lot of attenuation noise and high frequency crosstalk as a result.. I think I have a particuarly good backlink as almost nobody else I have spoken to comes even close to these speeds. Interleaving is off and I have a static IP and am running about (Enigma, flatmates server is not always on) 7 machines off the network running various different streaming tests. Sadly, the TR-80 is not connected as I don't think it could cope. From the looks of it we had the ADSL2+ profile enabled at the exchange a fews weeks ago however I have not really seem any real differnece it speeds. Have you thought just because the ADSL2 profile has been enabled at the exchange, that ADSL2 is not live yet? & it will be still be running at normal ADSL speeds in till Telecom 'flicks the switch' to ADSL2. My understanding is that when the ADSL2+ 'profile' is activated on the line, that means we should have ADSL2+. We have a sync speed to the exchange of 18 Mbits so I can't see why ADSL speeds would apply. Please correct me if I am wrong. The sync speeds may be up, but there are other profiles on the network that can apply. Well I have ordered my upgrade to Flood. The VoIP could use the extra bandwidth even if the speed doesnt improve just yet. WxC rep said it may be a few days tho as she thinks the staff who deal with that have gone home for the week.